A pool deck may just be one part of your whole property but if it looks unpleasant and is not functional enough for use, then it could ruin the overall value of your home. Also, your family would not be able to have outdoor water fun if the deck is not in the best condition to ensure their safety. 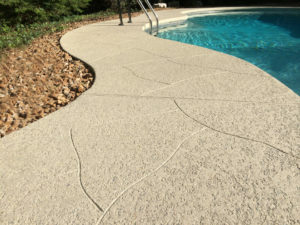 Now you can choose to abandon the pool area completely or you can have it revived with a pool deck resurfacing service. You’ve probably heard about this option because it is a popular trend nowadays. However, do not just be a trend follower. Identify what you want before you hire someone to resurface a pool deck so you can make the right material choice. Need help? Here are five characteristics that a material should have. Have you tried walking on a concrete surface after it has been exposed to the scorching heat of the sun for hours? Yep, it probably baked your bare feet excruciatingly. Although you can’t take the sun out of the picture, you can definitely make your pool deck a lot cooler on the feet. How? Choose concrete coatings that come in a light color because it absorbs less heat than dark ones. The fact that a pool deck is located outdoors is enough reason to opt for a material that can withstand the harsh effects of weather and temperature changes. The concrete deck should be able to endure frequent usage without the need for frequent pool deck repairs, especially during summer when pool usage is at its peak. When looking for pool deck refinishing materials, it is important to test a sample surface to see how slippery it would be when wet. Keep in mind that you may walk around the pool after a dip and your kids might frolic on it during a pool water game, so it has to be absolutely slip-resistant to prevent any type of accident. But make sure that if you do opt for a textured surface, it has to be textured enough to prevent slips but gentle on bare feet. Aesthetics is just as important as any other factors on this list. A visually pleasing pool deck can help boost your property’s resale value. Plus, it can be quite satisfying for you, and your neighbors, to look at a gorgeous pool area. Resurfacing pool decks often provide you with several options for colors, patterns, and designs to suit your style preference. After the resurfacing project is completed, you are presented with an utterly gorgeous pool deck that is clean and vibrant. However, it would not stay that way forever so you have to make sure that you would be a good housekeeper and maintain it as often as needed. Don’t fret. There are resurfacing overlays and coatings that require minimal maintenance in less frequency. This way, you can spend more time enjoying the pool area and less time keeping it in tip-top shape.